This is an appetizing and presentable dish which is not as hard to prepare as you think. Just a little practice will make it perfect. The only hard part I think is process of making the chicken lollipop. It requires some effort and knowledge to do it. But the cooking part is easy. Just like cooking your favorite fried chicken. In making the batter, it is also simple and you don’t need to add any beaten eggs which easily burn the chicken batter. Instead, only cornstarch is used and mixed with the marinade you used in marinating the chicken and presto! 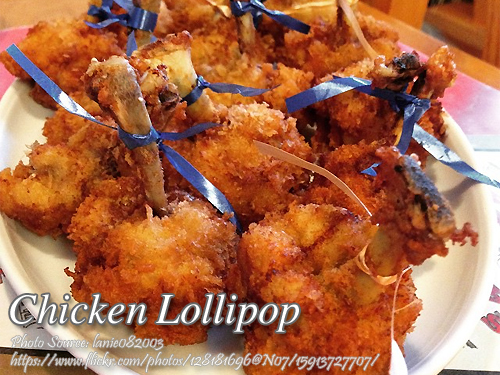 you already have a batter for the chicken lollipops. To make the marinade: Combine salt, soy sauce, chili powder, achuete powder, calamansi juice, garlic powder and finger chilies in a bowl. Mix very well and set aside. Prepare the chicken by cutting the chicken wings on the joints separating the wing tip from the other two sections of the wing, the middle part which has two bones and end part that has single bone. The middle and the end parts are to be made as chicken lollipops. Just store the wing tips in the fridge for other use like soup stock. Slide a knife around the tip of the bone to separate the tissue connected to the bone. Separate the meat from the bone by pushing the meat downwards while holding the bone until the lollipop shape is formed. Do the same thing on the middle part of the wing with two bones by removing the smaller bone. Marinate the chicken lollipops in the marinade for 1 hour. Remove the chicken from the marinade and add cornstarch to the marinade to make the batter. Dip the chicken lollipop in the batter and deep fry until golden brown for ten minutes. Drain excess oil using paper towel and serve with your choice of dip.